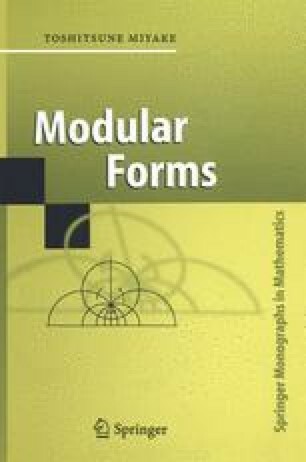 In the previous chapter, we studied modular groups and modular forms. The unit groups Γ of orders of indefinite quaternion algebras defined over ℚ are also Fuchsian groups and they are generalizations of modular groups. Automorphic forms for such groups Γ also play important roles in the algebraic geometrical theory of numbers. In this chapter, we recall fundamental properties of quaternion algebras, and study the structure of Hecke algebras of Γ. We quote some basic results on algebras and number theory from [Weil]. We follow [Eichler], [Shimizu 4] in §5.2, and [Shimura 3], [Shimizu 3] in §5.3, respectively. For a general reference, we mention also [Vignéras].